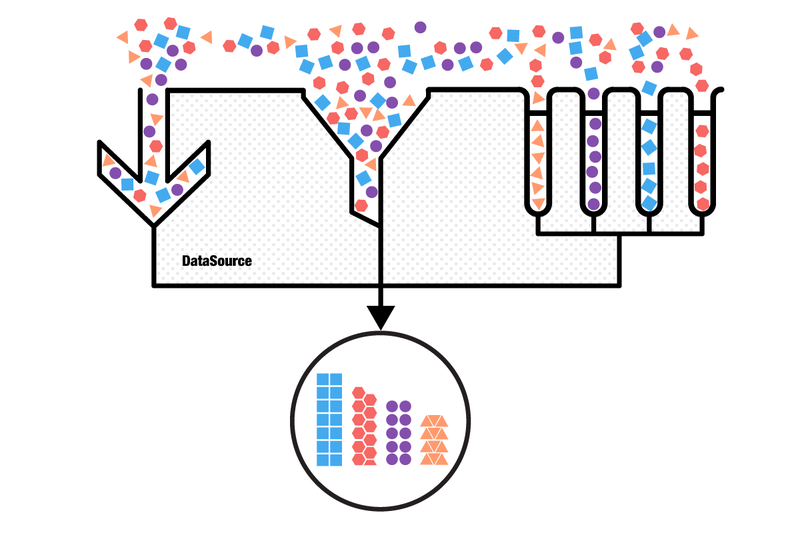 TKDataSource is a non-visual component that consumes data from various sources. It supports data shaping operations like sorting, filterign and grouping. It adopts the most used data enabled UI controls in iOS: UITableView and UICollectionView to automate the presentation of its data. TKDataSource works perfecltly with TKListView, TKChart and TKCalendar too. TKDataSource can consume various data types: simple arrays, arrays with business objects and dictionaries coming from various sources. Its easy to use API allows loading data from files and web services. For your convenience TKDataSource provides three differnet APIs for data shaping operations. You can use TKDataSource to present the same data in different UI controls at the same time. In this scenario TKDataSource syncs the current item in the presented controls.